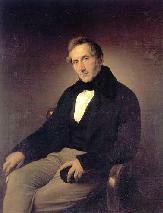 Francesco Hayez was the son of a French father and an Italian mother, Chiara Torcella. He was brought up by his mother's sister who had married Giovanni Binasco, a shipowner and collector. 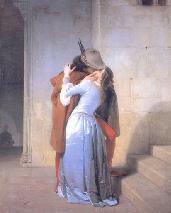 Hayez was educated for three years by Francisco Magiotto and then by Teodoro Matteini at the Academy of Fine Arts in Venice. In 1809 he continued his studies in Rome. In 1814 he left Rome for Naples, where Joachim Murat had commissioned ""Ulysses at the court of Alcinous". He mostly worked in Milan, where he painted religious and historical subjects as well as portraits. 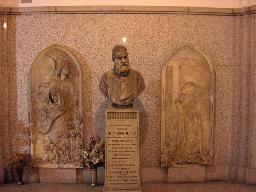 He was a teacher at the Brera in Milan and became director of the Brara in 1860. 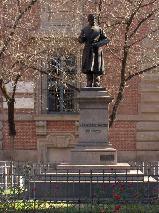 Statue of Francesco Hayez near the Pinacoteca di Brera, Milan. 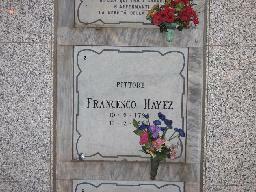 The gravesite of Francesco Hayez at the Famedio, Cimitero Monumentale, Milan. 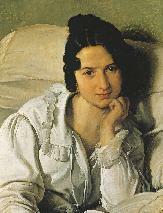 "Ritratto di Carolina Zucchi (La malata)".